​SAC1060 is a mechanically removable (requires needle nose pliers) support material that works with all Nylons. This includes all of TAULMAN3D’s Nylons as well as Carbon Fiber Nylon and Glass filled Nylons. While SAC1060 Prints at 235C to 255C like higher temp Nylons, it does not “melt into or weld onto” Nylons. It was developed to stick to all Nylons as a support material during the printing process, yet retain a mild adhesion at ambient temperatures. This allows the user to print at 240C to 280C base Nylons with a support material that does not warp or melt based on print temperatures. Super Hard Alloy 910 is a measurable advancement in 3D Printing materials technology from taulman3D. 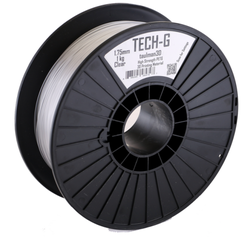 taulman Alloy 910 as stiff as PLA yet retains the durability of a hard Nylon. Alloy 910 is the combined effort of chemical companies, extrusion manufactures and taulman3D to specifically develop a single material to meet as many high performance 3D Printing needs as possible. With a combined tensile strength higher than the strongest co-polyesters, the durability of Nylons, a shrinkage factor that rivals our t-glase, a vast range of chemical resistance and a ~82C working range, you now have one solution easily printable at 250C-255C. We are extremely pleased to have the excellent co-operation of our top tier chemical company along with our extrusion manufacturing company. This team has worked together to produce an excellent polymer that not only meets chemical requirements, but enables the use of nylon 680 in most FFM type 3D Printers. Nylon 680 is compatible with Ethylene oxide and Flash Steam post processing. Please read for regulation information. Nylon 645 is currently being used by CNC shops around the world to support quick turn prototypes for Pre-Pilot and Pilot runs as well as some limited production runs. Nylon 645 has the highest chemical resistance of all of our Nylons and is highly compatible where Nylon 6,6 is required. PCTPE stands for "Plasticized Copolyamide TPE" or a chemical co-polymer of highly flexible nylon and TPE (thermoplastic elastomer) . PCTPE has several unique features that allow any user to print a highly flexible part with the added durability of our nylon polymers. This combination of polymers was developed specifically to allow anyone using current FFF 3D Printers to print parts from durable prosthetics to complete cosplay wearable outfits, cell phone enclosures as well as highly flexible utility/industrial parts. The flexibility of PCTPE means that the end parts will have the smooth lustrous texture of nylon, and the added flexibility offered by a rubber like TPE. Bridge Nylon is similar to Nylon 645 with excellent tensile and low friction surface. While similar to Nylon 645, Bridge is chemical resistant to most chemicals except chlorine, bromines and some petrols. Bridge Nylon is fully capable of thread tapping and machine tooling. guidel!ne - A medical grade ISO 10993 FDA reg material. t-glase (called TEE-GLASS) is an “optically correct” or water clear polymer that comes in Clear, Red, Green, Blue, White, Black and Aqua. Red, Green, Blue and Aqua are translucent rather than opaque. t-glase is a food and beverage safe polymer and carries the recycle rating of "1". t-glase is one of the lowest shrinkage of the polyesters. With optical coatings, t-glase can appear as clear as a glass part. t-glase prints at 235-245C. One can easily print light guides or light pipes. TECH-G was developed to not only be high strength, but also have limited elongation. Engineering firms were using PLA and ABS for initial Form and Fit evaluations. In some cases, the strength of these materials allowed some limited functional use. In the case of PLA, it was the brittle nature of medium or larger parts that severely limited functional testing. With ABS, the limit was always Tensile strength. With TECH-G, we believe we have now given the development and design industry an easy to print material with much higher Tensile when 3D Printed and enough elongation so as to be truly useful in functional testing. taulman3D and DuPont Packaging & Industrial Polymers (DuPont) worked together to manufacture and release a unique new flexible material to the 3D printing community called T-lyne that uses DuPont™ Surlyn® ionomer. T-lyne is a unique, crystal clear polyethylene co-polymer developed specifically for high durability, flexibility, unique viscosity and a wide temperature range. Glass-like aesthetics can easily be obtained at high layer sizes using low speed and low temperatures in the range of 190 C to 210 C. Utility style parts are easily printed faster at standard layer sizes using higher temperatures up to 245 C, depending on nozzle size.